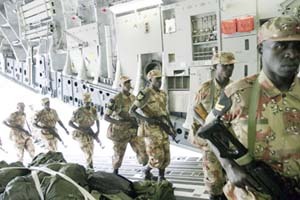 Rwandan troops, part of the African Union military operation in Sudan, board a U.S. Air Force plane, July 17, 2005, in Kigali, Rwanda, headed to Darfur region. The U.S. government is seeking to use a peace agreement between the government of Sudan and opposition forces in the Darfur region to open the road for an imperialist-led military force in that area. The May 5 accord calls for the disarming of pro-government militias and the integration of the opposition Sudan Liberation Army (SLA) forces into the national army. On May 9 U.S. secretary of state Condoleezza Rice went to the United Nations to call for speeding up the deployment of UN peacekeeping troops to Darfur, a large region in the west of Sudan. U.S. deputy secretary of state Robert Zoellick was Washingtons point man in brokering the deal. The Sudanese government had rejected any UN peacekeeping force in Darfur until such an accord was signed. Some 10,000 UN-helmeted troops are already deployed in the country as the result of a 2005 pact that ended a 21-year civil war between the government, based in the largely Arab north, and the Sudan Peoples Liberation Movement in the largely Black south. In addition, about 7,000 African Union troops are currently in Darfur. An expanding African oil industry, centered in West Africas Gulf of Guinea, has already brought an increased U.S. military presence to the region. And over the last decade Sudan has emerged as the third-largest oil producing nation on the continent. Oil accounts for about 70 percent of Sudans exports. The opening for imperialist intervention in Sudan has been a devastating crisis triggered by a three-year civil warmore than 200,000 people are estimated to have died, and 2 million left homeless. The antigovernment insurgency in Darfur is led by the SLA and the smaller Justice and Equality Movement (JEM). They accuse the central government in Khartoum of discrimination against the largely Black population in this western region. Arab-speaking militia groups known as the Janjaweed, which the rebels say are backed by the government, have carried out bloody attacks on the civilian population in an effort to crush the revolt. Under the May 5 accord, the national authorities have pledged to disarm the militia, accept about 5,000 opposition troops into the army and police, and share power in a temporary regional government to be created in Darfur. The JEM and a faction of the SLA refused to sign the agreement, demanding government positions and funding. In the United States, an April 30 Stop Genocide rally of tens of thousands in Washington heard Democratic and Republican politicians call for military intervention in Sudan. The Democrats included Alfred Sharpton, Sen. Barack Obama of Illinois, and Rep. Nancy Pelosi of California. U.S president George Bush also endorsed the rally. United for Peace and Justice, which organized an April 29 rally against the U.S. occupation of Iraq, is backing weekly vigils at the U.S. mission to the United Nations to demand that UN troops be sent to Darfur. The pro-intervention actions are promoted on the groups website. No imperialist intervention in Sudan!